October's #kidlitpicks theme is Unlock Their Imagination. So many books came to mind with this theme because picture books are one of the best ways to explore imagination! I thought about books starring imaginary friends, like The Adventures of Beekle by Dan Santat, Dotty by Erica S. Perl, illustrated by Julia Denos, and Imaginary Fred by Eoin Colfer and Oliver Jeffers, which I've featured before. Recently we've read so many clever picture books that engage children's imaginations, whether the books asks for the child to search for a hidden detail in each picture (Yoo-Hoo, Ladybug! ), answer questions posed in the text (Trashy Town), or just broaden their horizons with new vocabulary and interesting illustrations. On our quest, we found a great book about real friends, Birt and Etho, who use their imaginations to transform boxes into...anything else! Birt loves his best friend and how their imaginations fit together to make all their days fun. When a new boy, Shu, wants to join in with the box-fun, Etho welcomes him, but Birt isn't so sure. Underneath all of the box imagination fun, Big Friends by Linda Sarah and Benji Davies is a gorgeous, touching picture book about the fragility of friendships and how they can grow. A great read alike for Big Friends is Not a Box by Antoinette Portis. We have the board book, so it was a natural progression to step up to a bigger, more involved picture book. In Not a Box, a bunny plays by himself, imagining a simple box is a race car, a boat, and more. 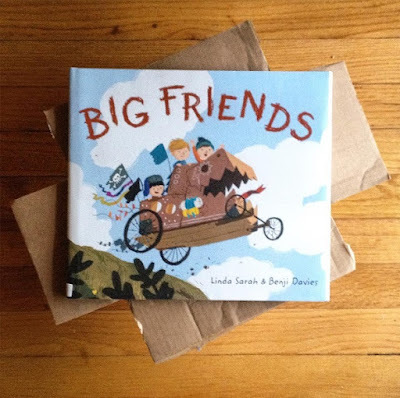 In Big Friends, two boys play together to imagine what a box can be for them. Check out other books to #unlocktheirimagination on the homepage @kidlitpicks, and tag your favorite #imagination books to be featured! Banned Book: Who's In My Family?